Oversized or anything bigger than normal ... smaller than normal didn't usually call to me. Juxtaposition or surprising combinations ... a series of blue wine bottles with words such as "gratitude," "misery," or "pity" etched onto them with a warning not to open under pressure. 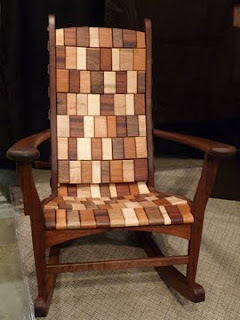 Anyway, my find for the day was Alan Daigre, a woodworker who makes some of the most beautiful chairs I've seen ... and amazingly enough they are exceptionally comfortable. Daigre calls them "rope chairs" (we need to think of a new name for them) and I was fascinated by the thinking behind them so we struck up a conversation. It turns out he was looking for a way to make a chair "universally comfortable" and started with the idea of articulation so that the chair could conform to any body type. He says he went through a lot of failed experiments before getting to the current model and only then did he start working on the aesthetics. As you can see from the picture, the chairs are incredibly lovely and unique. He uses a mix of indigenous Tennessee hardwoods, often from his own property. (You can see more at his website ... http://www.alandaigre.com).